This is Nadine's third book and is a wonderful continuation/companion book of her life in Costa Rica. I have enjoyed all of her books with the first one being my very favorite. 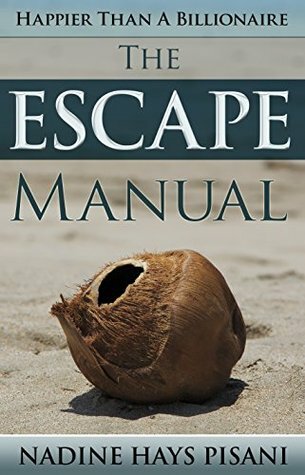 What I enjoyed about "The Escape Manual" were the tips and links to the places they visited, which allows you to check out those places for yourself. The quick spin around the whole country allows the reader to get a feel for the many different areas and climates that are in Costa Rica. Another great read by Nadine Pisani! Tons of useful infoLighthearted writing with lots of info packed in between anecdotes. A bunch of useful links to sites to help in your planned vacation or move. Sure, you may have read about some of this elsewhere, but I find it can't hurt to get info from multiple sources and multiple perspectives. Nadine is a very engaging author. This is a great book for someone that wants to retire in Costa Rica. Nadine is funny and she's nice. I emailed her while we were in Costa Rica and she wrote right back. It's nice to know there are real people out there. I can't wait to move to Costa Rica!! Useful informationThe third book in the series has some great suggestions of places to visit. It is written more like a travel guide rather than a story. Absolutely loved it! Pura Vida! Nadine Hays Pisani - Nadine was born in Elizabeth New Jersey and attended Rutgers University. She lives in Costa Rica with her husband and dog, Clementine. When not writing, you can find her at the beach, on the back of a scooter, or frantically tossing scorpions out of her bed. She shares her weekly adventures on her blog.